This article, prepared by Dr Gemma Tatangelo (Australian Catholic University), discusses children’s body image and ways in which resilience can be built in those who live with limb difference. accepting of yourself as you are (most of the time). It is important to remember that everyone has bad days. Just because you feel frustrated with yourself sometimes, doesn’t mean that you have an unhealthy body image! The same is true for children. Children will have bad days where they feel disappointed or unhappy with themselves and their bodies. Unless this is the case most of the time, they probably do not have poor body image. How does body image develop among children? Body image begins to develop in children around the age of three. However, it is not until the ages of about 5 to 8 years old that children being to compare their body to others. Therefore, primary school-aged children become aware of the ways that they are similar and different from others. Research shows that this is also the age at which body image concerns start to develop. For children with limb difference, body-comparisons may relate to their limb difference or other aspects of their appearance. What contributes to the development of body image concerns among children? There is no simple answer to this question. It is a combination of factors including parents, children’s peers and the media. Parents: Parents can be influential in shaping their child’s views about the importance of physical appearance. In addition, research shows that children copy the attitudes that parents have towards their own bodies. Peers: Teasing from peers can also have an impact on children’s feelings towards their body. Media: Children are inevitably exposed to various types of media such as television shows, movies, advertising, online games etc. Unfortunately, the media create an impression that only one kind of body shape is ‘ideal’. These days, it is impossible to shield children from all of the factors that may have a negative impact on their body image. Media is pervasive and everywhere. It is also difficult to always protect children from the insensitivity of other children. Furthermore, even the most well-meaning parents will occasionally be critical of their body in front of their children (Does my bum look big in this?). Therefore, the best way to protect children from these influences is to build-up their self-esteem, resilience and body image, so that they are not as vulnerable to these pressures. Below are some simple strategies for parents to do this. For parents of children with limb differences, it can be difficult to hear their child talk about the things that they feel they can’t do. Sometimes, the natural reaction is to change the subject or distract the child. However, it can be stressful for the child if their feelings about their differences aren’t validated. So, if your child wants to talk about the ways they are different, use it as an opportunity to discuss the ways that no two bodies are the same and that is okay. Celebrate diversity with your child by discussing ways that everyone has different characteristics and personal qualities (An activity example: with your child, help them to list all characteristics that they have in common with other family members, and then ways that they are unique from other family members, and finally how other family members are unique from each other). It is also important to demonstrate to your child that everyone has something special to offer regardless of their size, shape, appearance and abilities. Strategy 2: Show your child that people are valuable for who they are, not what they look like or what they can do. Praise their personality traits, behaviours and skill development (for example, in addition to saying things like, “you’re so strong” or “you look pretty”, it is important to also praise their personal qualities, “you are so kind”, “you’re a fantastic reader”). Self-efficacy relates to a person’s belief in their ability to succeed in their activities and goals. A person’s self-efficacy determines how they approach tasks, challenges and goals in their life. It is important to foster children’s confidence in their own abilities, particularly among children with limb difference. There are a few ways that parents can encourage their child’s self-efficacy. Help you child find the things they are good at. Every child should feel like they are good at something. Allow your child to try different activities (they can be simple things like drawing, painting, singing, story-telling etc.) until they find some things that they enjoy doing and feel that they are good at. Give them achievable responsibilities. Children need to feel useful and important. You can encourage this by giving them age-appropriate responsibilities (for example, allowing the child to be responsible for collecting the mail or feeding the dog). Allow the child to make (some) decisions for themselves (where possible). Allowing your child to make some decisions teaches them that their opinion is worthwhile and important, and that they are capable. For very young children, this can be as simple as asking them what they would like to wear or whether they would like apple or orange juice. For older children, this might involve asking them what type of activity they would like to try. Children are naturally curious and unfortunately they are often very insensitive in the ways they ask each other about their differences. Therefore, it is important to prepare your child for questions about their limb difference. This will enable your child to be able to respond to their peers with confidence and in a way that is comfortable for them. Help your child to find a way to explain their limb difference that is age-appropriate and comfortable for them. Practice this with your child so that they know what to say if someone asks. This will give your child the ability and the opportunity to teach others about limb difference and this will be empowering for them. This will also encourage a feeling of openness and acceptance of diversity for your child. Also try to be mindful that children will listen and take-on-board the ways in which their parents talk about their limb difference. All children will have days when they feel bad about something that has happened, something that someone has said, or something they feel they can’t do. While this is unavoidable, there is something you can do to make it easier for the child and improve their outlook. The below technique can help the child to restructure how they think about their strengths and weaknesses. (Note: This activity is suited to children aged 6 and over. It is best to do this activity with your child in advance so that they already know how to use the strategy when a difficult situation arises). You can use the scenario below with your child as an initial example of the concept. After that, you can think of other hypothetical scenarios as practice. Initially, you will need to help your child through the process, but after practicing a few times with hypothetical scenarios; the child will then be able to apply the concept to their own situations. 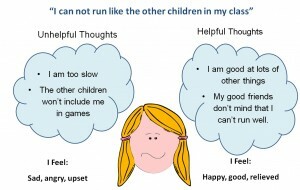 Scenario: “Kate feels like she can’t run like the other children in her class”. Step 1: “What are some unhelpful thoughts that Kate might have?” (Help the child to identify unhelpful thoughts). Step 2: “How would this make Kate feel?” (Help child to identify negative emotions). Step 3: “What are some more helpful thoughts that Kate could think” (Help the child to identify helpful thoughts). Step 4: “How would this make Kate feel?” (Help child to identify positive emotions)”. Limbs 4 Life would like to thank Dr Tatangelo for sharing her knowledge about children’s body image and strategies for building resilience in children with limb difference.